ანა-ლუიზა კრატჩის საუბრის მთავარი თემა იქნება ცარიელი ინდუსტრიული არქიტექტურა და მათი გამოყენება, როგორც კულტურული ღონისძიებებისთვის განკუთვნილი სივრცე. ისეთები, როგორიც არის Mass MoCa (მასაჩუსეტსი, აშშ), Dia: Beacon (ნიუ ორკი, აშშ), Tate Modern (ლონდონი, დიდი ბრიტანეთი) და Spinnerei (ლაიფციგი, გერმანია). როგორ შეიძლება დაცარიელებული ქარხნების შენობების რე-აქტივირება? რა ზომები არის ამისთვის საჭირო? The talk will focus on empty industrial architecture and its re-use as cultural locations such as Mass MoCa (Massachusetts, USA), Dia: Beacon (New York), Tate Modern (London, GB) and the Spinnerei (Leipzig, Germany). How can empty factory buildings be re-activated? What benefits do they provide? ანა-ლუიზა კრატცში დაიბადა 1980 წელს ჩრდილოეთ გერმანიაში რუგენის კუნძულზე. 1997/98 წლებში იგი ცხოვრობდა აშშ-ში (ცინცინატი),ხოლო 2000/2001 წლებში მადრიდში, ესპანეთში, სადაც ვრცლად გაეცნო ვიზიალური ხელოვნების და მუსიკის მხატვრულ განათლებას. 2002 წლიდან სწავლობდა ლაიპციგის უნივერსიტეტში ხელოვნების ისტორიის და კულტურის ფაკულტეტზე. ამავე წელს გახდა სახელმწიფო პროგრამის სტიპენდიანტი. 2004 წელს ანა-ლუიზა კრატცშმა კურატორობა გაუწია მის პირველ გამოფენას EIGEN + ART-ის გალერეაში და 7 თვე დაჰყო ნიუ-ორკში, სადაც გაიარა ორი პრაკტიკული კურსი ISCP (საერთაშორისო სტუდიების და კურატორების პროგრამა) და ბრუკლინის ხელოვნების მუზეუმში. ლაიფციგში დაბრუნების შემდეგ მუშობდა როგორც კულტურული პოლიტიკის პლატფორმაზე (Kulturpolitischer Salon), ასევე ფედერკილის ფონდში ლაიპციგის ახალ მხატვრულ უბანში ყოფილი სართავი ქარხნის ტერიტორიაზე (Spinnerei). 2006 წელს მან დაამთავრა ლონდონის კორტოდის ხელოვნების ინსტიტუტი თანამედროვე ხელოვნებაში პოსტ-კომუნისტური სწავლების განხრით. 2006/07 წლებში იგი სწავლობდა მანდარინის ენას და მუშაობდა გოეთეს ინსტიტუტში პეკინში. 2006 წლის ივნისში ანა-ლუიზა კრატცშმა დაარსა LIA - ლაიფციგის საერთაშორისო სახელოვნებო პროგრამა, არა კომერციული ინსტიტუტი და ხელოვანთა რეზიდენცია თანამედროვე ხელოვნების და კულტურის ხელშეწყობის მიზნით. 2007 წელს მოეწყო ინსტიტუტის პირველი გამოფენა იაპონიის ფონდთან და ბერლინში იაპონიის საელჩოსთან თანამშრომლობით. მას შემდეგ LIA - ლაიფციგის საერთაშორისო სახელოვნებო პროგრამის ფარგლებში მან უმასპინძლა 40-ზე მეტ ხელოვანს 17 სხვადასხვა ქვეყნიდან, კურატორობა გაუწია გამოფენებს ლაიფციგში, ბერლინში (Caps Lock Projects, LIA`s temporary project space 2010) და ნიუ-ორკში (Leipzig Calling, exhibition at the New York Academy of Art 2009). თბილისში GeoAIR რეზიდენციის ფარგლებში ანა-ლუიზა კრატცში მონაწილეობას მიიღებს "არტისტერიუმში", თბილისის საერთაშორისო თანამედროვე ხელოვნების გამოფენაში და გოეთეს ინსტიტუტის საქართველოს მიერ მოწყობილ საერთაშორისო სიმპოზიუმში TRANSRELATION, რომელიც ჩატარდება 2010 წლის 2-5 ოქტომბერს. ანა-ლუიზა კრატჩი მოხსენებას წაიკითხავს 5 ოქტომბერს, 10-13 საათის სესიის ფარგლებში. მისი თემა "რეალიზმი - მხატვრობის ტრადიციები კომუნიზმის და პოსტ-კომუნიზმის შუალედში" ლაიფციგის მაგალითზე განიხილავს მის "სკოლებს", პროტაგონისტებს ისევე, როგორც გერმანიაში ფიგურალური ხელოვნების ისტორიულ და აქტუალურ აღქმას. 1. კომუნისტური ერა - რას ნიშნავს სოციალისტური რეალიზმი და რა გავლენა ჰქონდა მას როგორც აღმოსავლეთ ასევე დასავლეთ გერმანიაში ფიგურალური ხელოვნების აღქმაზე. მაგალითი: ლაიფციგის ვიზუალური ხელოვნების აკადემია და "ლაიფციგის სკოლა": ვოლფგანგ მათოიერი, ვერნერ ტიუბკე და ბერნჰარდ ჰაიზიგი. 2. პოსტ-კომუნისტური ერა - ვაიმარის ‘The image war’: სხვაობა ხელოვნების აღქმაში, აღმოსავლეთ გერმანია დასავლეთ გერმანიის წინააღმდეგ. 3. აწმყო - ხელოვნების ბაზარი და "ლაიფციგის ახალი სკოლა - EIGEN + ART გალერეის მაგალითზე. როგორ წამოიწია EIGEN + ART წინა პლანზე გლობალური ხელოვნების ბაზარზე ფიგურალური მხატვრობის სექტორის ჩამოყალიბებისას; ქალაქის კულტურული სახის და ფიგურალური მხატვრობის მოდის რეაბილიტაცია; როგორ განვიხილავთ ფიგურალურ ხელოვნებას დღეს და რა როლს თამაშობს გლობალური სახელოვნებო ბაზარი და მედია ჩვენს მიერ მის (ფიგურალური ხელოვნების) აღქმაში. Anna-Louise Kratzsch was born 1980 in Northern Germany on the Isle of Rügen. She lived for one year 1997/ 98 in the USA (Cincinnati) as well as Spain (Madrid) in 2000/ 2001 and has experienced a broad artistic education in the visual arts and music before she began to study at the University of Leipzig in the Art History and Cultural Studies Department in 2002. In the same year she became fellow of a federal scholarship programme (Evangelisches Studienwerk Villigst e. V.). In 2004 Ms. Kratzsch curated her first group show in the gallery EIGEN + ART and spent seven month in New York City, where she passed two internships, at the ISCP (International Studio and Curatorial Programme) and the Brooklyn Museum of Art. When she returned to Leipzig she worked on a platform of cultural politics (Kulturpolitischer Salon) as well as Foundation Federkiel at the Spinnerei, the new artist district of Leipzig. In July 2006 she graduated with a Masters in Post-Communist studies in Contemporary Art at the Courtauld Institute of Art in London. In 2006/ 07 she studied Mandarin and worked for the Goethe Institute in Beijing. In June 2006 she founded LIA – Leipzig International Art Programme, a not for profit institution and artist in residency programme to foster contemporary art and culture. In November 2007 Ms. Kratzsch organised the institution’s first exhibition in cooperation with the Japan Foundation and the Japan Embassy of Berlin. Since then she hosted over forty artists from seventeen nations in LIA and curated exhibitions in Leipzig, Berlin (Caps Lock Projects, LIA`s temporary project space 2010) and in New York City (Leipzig Calling, exhibition at the New York Academy of Art 2009). 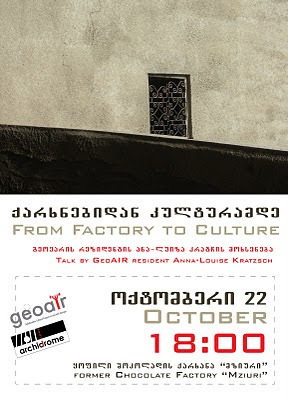 During her residency at GeoAIR Anna-Louise Kratzsch will be participating in TRANSRELATION - International Symposium of Contemporary Arts Tbilisi, October 2-5, 2010 organized in cooperation with Goethe Institute Georgia and “Artisterum” 3rd Tbilisi International Contemporary Art Exhibition and Art Events. Anna-Louise Kratzsch's talk will take place on October 5th, 2010, during 1st session 10 am.- 1 pm. Her talk "Realism – Painting traditions between communism and post-communism" will focus on a case study of Leipzig, its ‘schools’, protagonists and the historical and current reception of figurative art in Germany. 1. Communist era – What Socialist Realism means and the impact it had on the reception of figurative painting in both Eastern and Western Germany. Referring to the Leipzig Academy of Visual Arts and the ‘Leipzig School’: Wolfgang Mattheuer, Werner Tübke and Bernhard Heisig. 2. Post-Communist era – ‘The image war’ of Weimar: The differences of art perception, Eastern Germany versus Western Germany. 3. Present –The art market and the ‘New Leipzig School – Case study EIGEN + ART. How EIGEN + ART came to the forefront in shaping the figurative painting sector of the global art market. Rehabilitating both the face of a cultural city and the trend of figurative painting. How we look at figurative painting today and what role the global art market and the media play with the way we perceive art.